What Game Could Possibly Make A Kid This Sad? Look at this little boy’s face. He is the saddest little gamer who ever gamed. What sort of video game does this to a child? Over the course I trying to find a way for my children to entertain themselves this summer that doesn’t involve iPads or leaving the freezer open all night, I performed an Amazon search for “safe trampolines.” And though I determined via user reviews that there are no safe trampolines and they should only be purchased for children you hate, my Facebook feed has become a never-ending advertisement for the Springfree Trampoline. That’s where I saw the video the still above was taken from. I’ve watched it several times now, weighing my need to enclose my children in protective netting against my lack of a spare $1,000 or more to spend and overall concerns about the integrity of their limbs. Every time I watch it, this little boy breaks my heart. I keep trying to imagine what’s on the screen that’s crushing him so. It’s something PlayStation 3-ish, so I hopped over to Gamerankings to browse the worst games for that system. Several of the worst-reviewed games on the list might elicit such a reaction from a seasoned gamer, but most of these would at least have younger children paying attention. Look at the first and fourth child on the couch. Whatever is being played has either bored or upset them to the point that they’ve lapsed into a sort of fugue state. I’d say Kung Fu Rider, but none of the children have PlayStation Move controllers. Maybe the sadness has nothing to do with the game. Maybe it’s a mechanical failure. 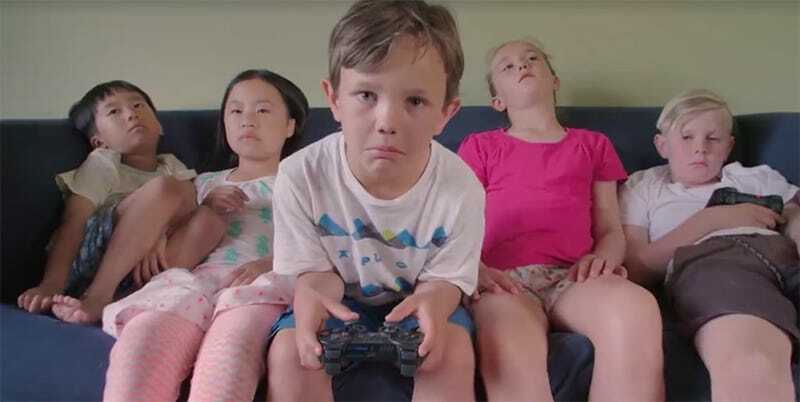 The boy in the middle is trying to play a game with a controller that is not connected, while the child on the far left is holding one that is. Note the red light. Or maybe they’re just all sitting on a couch in front of a video camera with an adult telling them to look as bored or disappointed as humanly possible while text about kids spending too much time looking sad on a couch scrolls along the bottom of the screen. Nah, that couldn’t be it. Maybe they are playing Amy. Or maybe the boy in the middle stumbled upon his parents’ media server and found a video that proves Sparky isn’t living on a farm in the country where he can play with other happy puppies all day long. Some good has come of this Springfree video. After watching it a dozen or so times, I’ve decided that I will only let my children play video games that make them happy, at least until they’re old enough to make that decision for themselves. That, and I’m double password protecting my media server. As for the saddest gamer ever, do not worry. He is in a better video shot now.